Home : Entertainment : Bollywood : Bipasha promoting Dishkiyaoon!! 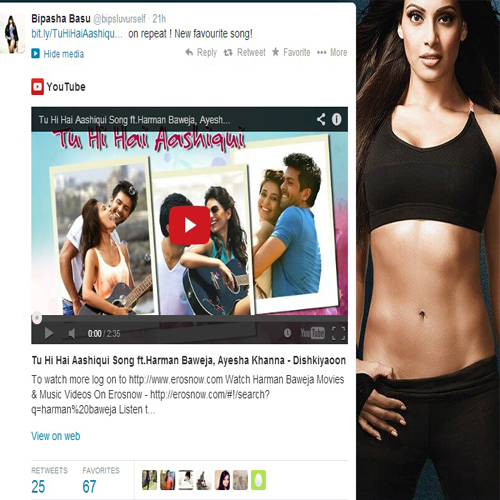 Bipasha Basu recently tweeted about the song that currently tops her playlist. Tu Hi Hai Aashiqui from the Harman Baweja starrer "Dishkiyaoon"Â is steadily climbingÂ the charts, and has impressed the sultry beauty, as well. The actor shared the song in a tweet that read, Tu Hi Hai Aashiqui -on repeat ! New favorite song! ''.